In 1967, Jocelyn Bell Burnell and Anthony Hewish saw a signal that they didn’t understand: a regular flash of radio emission coming from the same point on the sky, once every 1.3 seconds. It was named CP 1919, although privately they nicknamed the star LGM-1 (standing for Little Green Men) after the suggestion that the radio pulses were signals from an alien civilisation. While their signal was — spoiler alert — not aliens, it was the discovery of two things: the first known pulsar, and the first known neutron star. Until now, every known pulsar has contained a neutron star with a strong magnetic field. The magnetic field accelerates charged particles in its atmosphere and causes them to emit synchrotron radiation in two beams, pointing away from the north and south magnetic poles of the star. If the magnetic pole is not lined up with the rotation poles, these two beams sweep through space like rays of light from a lighthouse, appearing to observers on Earth as regular flashes of radio waves. Neutron stars have long been thought to be the only stars dense and magnetic enough to cause these beams. Today we see that this is no longer true, as we take a look at the first ever known white dwarf pulsar. Figure 1: Artist’s impression of AR Sco. Image by Mark Garlick, taken from the discovery’s press release. AR Scorpii, or AR Sco, is a binary system containing a white dwarf and a main sequence star. Earlier this year, it was discovered to pulsate incredibly strongly — its brightness can increase or decrease by as much as a factor of four in as little as thirty seconds! Some of these pulsations are shown in Figure 2. These pulsations are seen across the electromagnetic spectrum, from radio all the way up to ultraviolet. There are three time periods we see in the pulsations. Two are the orbital period of the system (3.5 hours) and the rotation period of the white dwarf (2 minutes, which is much faster than a white dwarf normally spins). The third period we see, which is also around 2 minutes long, is a so-called ‘beat’ period that comes from interference between the orbital and rotation periods. 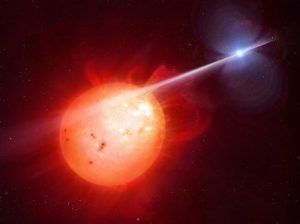 The beat period implies some interaction between the white dwarf itself and the main sequence star, such as pulses from the white dwarf reflecting from the other star’s surface. Strangely, this beat period is the most pronounced period in the data. If it is indeed a reflection effect, we see more of the reflected light than we see light from the white dwarf itself, a state of affairs which is hard to explain. Figure 2: The pulsations of AR Sco. 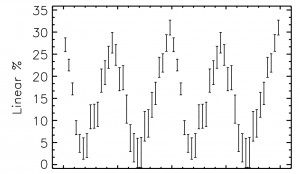 These data cover approximately 30 minutes, which is 15% of a full orbital cycle. This is Figure 1 from today’s paper. Figure 3: Percentage of photons which were polarised. The spikes in polarisation line up well with the pulsations in the previous figure. This is Figure 3 from today’s paper. Today’s paper presents a new set of data on this system. For the first time, the polarisation of radiation from the system has been measured. Polarisation is the amount by which light is aligned; if you think of light as a collection of waves, polarised light would would have the peaks of each set of waves pointed in the same direction, while unpolarised light would have them pointed in random directions. The team behind today’s paper measured how polarised the light was from AR Sco, and found interesting results. Between pulses, the light is only around 5% polarised (meaning that around 5% of photons are polarised). During each pulse, however, they saw the polarisation rise to more like 30%. Take a look at Figure 3 to see for yourself. Clearly, the process causing the pulsations must be able to produce polarised light. The most likely candidate is synchrotron radiation, the process that powers pulsars. So where does that leave us? The white dwarf in AR Sco must have formed with an unusually strong magnetic field, up to 500 mega-Gauss (this is around 10 times as strong as an MRI machine, or 10,000 times as strong as a fridge magnet). Its rotation was then sped up to the short rotation period we now see. In neutron star pulsars this ‘spin-up’ occurs during the formation of the neutron star: as the star collapses from a puffy giant star core to a dense neutron star, conservation of angular momentum forces it to spin faster. In AR Sco, because the white dwarf is not as dense as a neutron star, the same explanation won’t cover the extremely fast rotation that we see. It is suggested that the spin-up may instead have involved mass transfer between the two stars in AR Sco. However it happened, we were left with a dense, fast-spinning, highly-magnetic object emitting two beams of synchrotron radiation. There are still questions to be answered, but for now it seems likely that AR Sco is the first white dwarf pulsar!